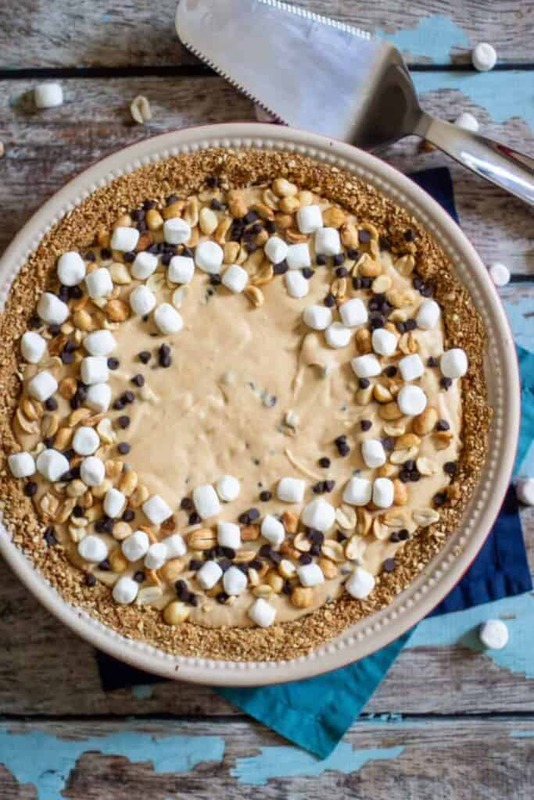 This Peanut Butter Marshmallow Pie is a lot of things. 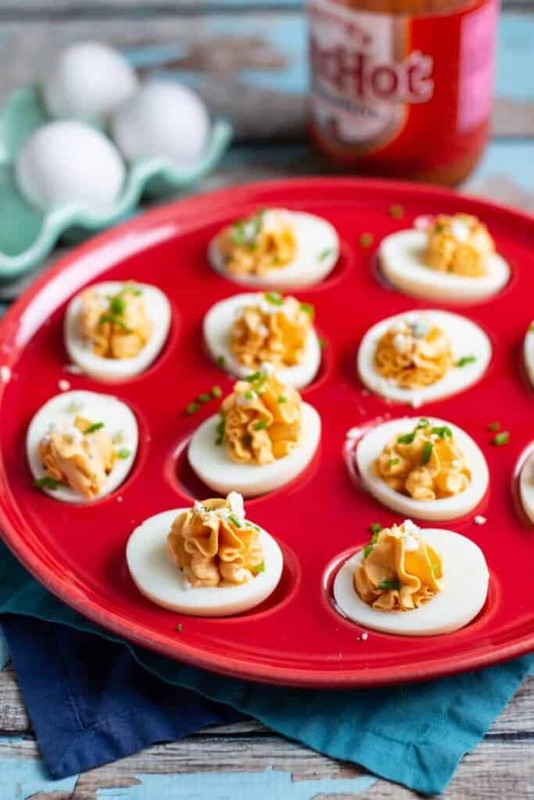 It is sweet, cold, creamy, and yet also a bit salty and crunchy. One of the best things about this pie, in my opinion, is that it is nearly no-bake! Just pop the crust into the oven for 10 minutes and then let the freezer do the rest of the work. This pie was inspired by a candy bar that I impulsively picked up while in World Market a few weeks ago. It was a milk chocolate bar that had peanuts, pretzel pieces, and marshmallow in it. I mean, sure, I was walking around the store while borderline hangry, but that thing was good. I went home and started to wonder how I could incorporate all of those flavors into a dessert creation of my own. Pie seemed like a good candidate. 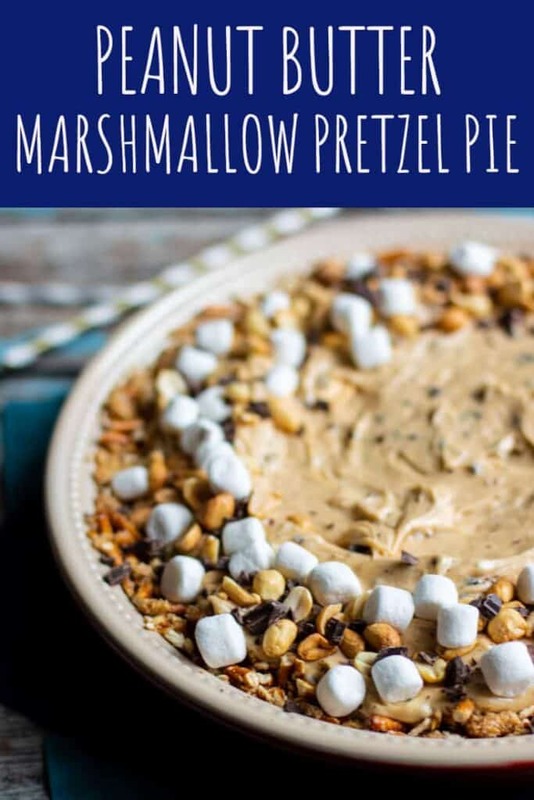 I thought back to the Chocolate Peanut Butter Pie that I shared with you before and wondered what would happen if you folded marshmallow fluff/creme into the peanut butter filling. As it turns out, delicious things would happen if you did that. The crust is a little sweet, but mostly salty, and made out of pulverized pretzels, brown sugar, and melted butter. 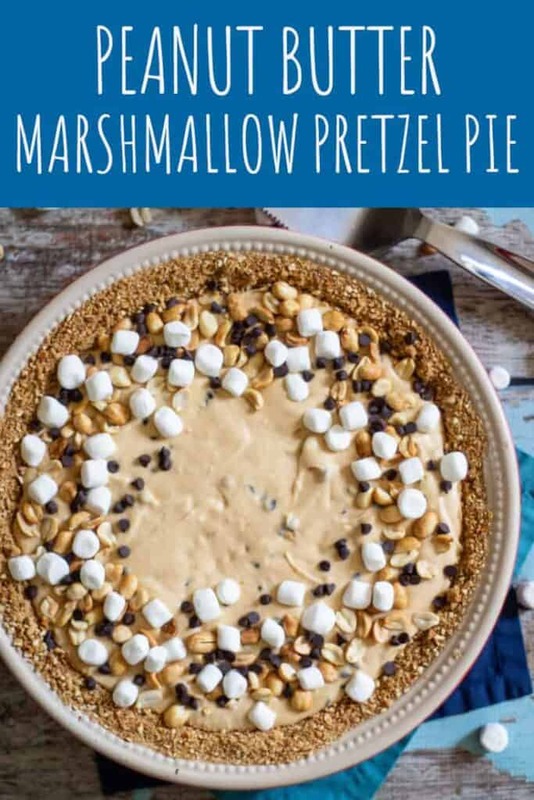 The combination of cold and creamy filling, salty crust, and crunchy toppings (okay there are soft marshmallows, too) is 10/10. 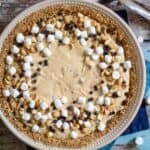 After you whip up this Peanut Butter Marshmallow Pie, don’t forget to check out this Almost No-Bake Chocolate Peanut Butter Pie, too! Blitz the pretzels in a blender or food processor until fine crumbs form. Add the brown sugar and melted butter. Blitz again until everything is well combined. Press the pretzel crust into the bottom, and up the sides, of a 9-inch pie pan. Bake for 10 minutes. Allow the crust to cool. Using a hand mixer, beat the cream cheese, marshmallow creme, and peanut butter together. Add the heavy cream and beat again until a smooth filling forms. Add the mini chocolate chips to the pie filling and mix until they are well distributed throughout the filling. Pour the filling into the prepared pretzel crust. Smooth the top with a spatula. 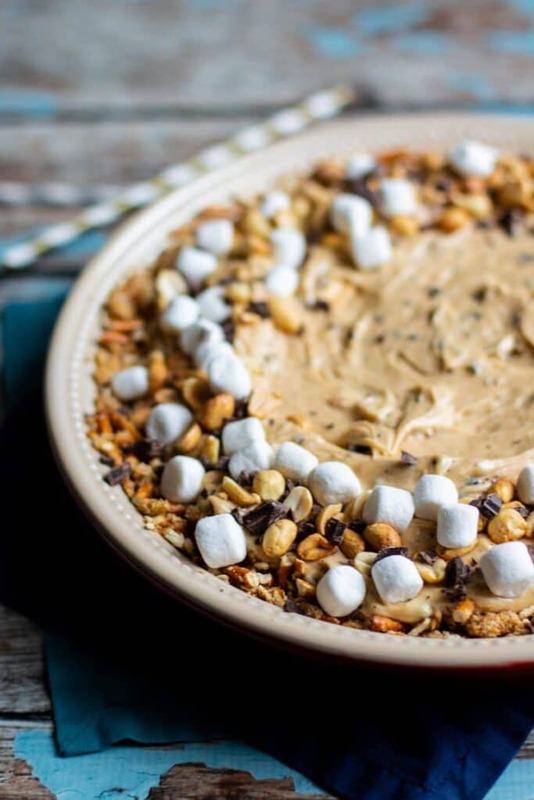 Top with mini chocolate chips, peanuts, and mini marshmallows. 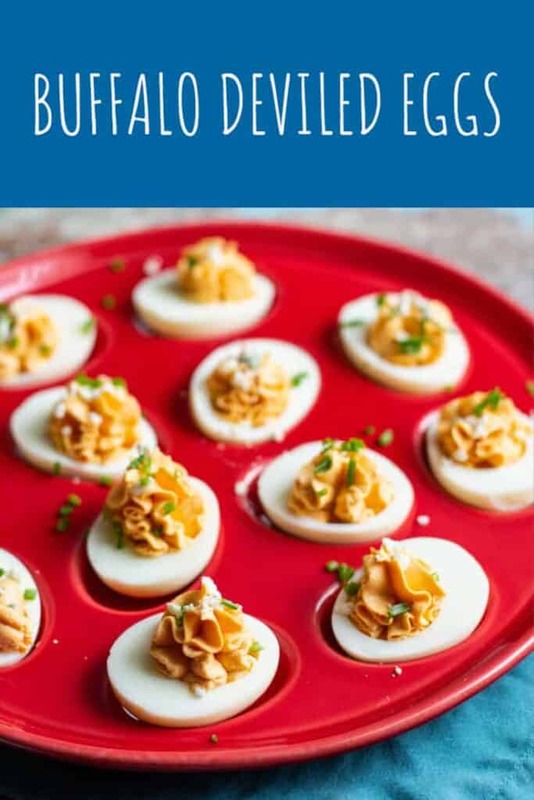 Freeze for 3 hours. This pie can be served frozen or refrigerated. 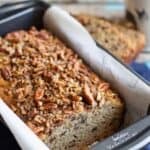 This Gluten Free Banana Bread is dense, moist, and studded and topped with crunchy pecans. Know what’s even better? 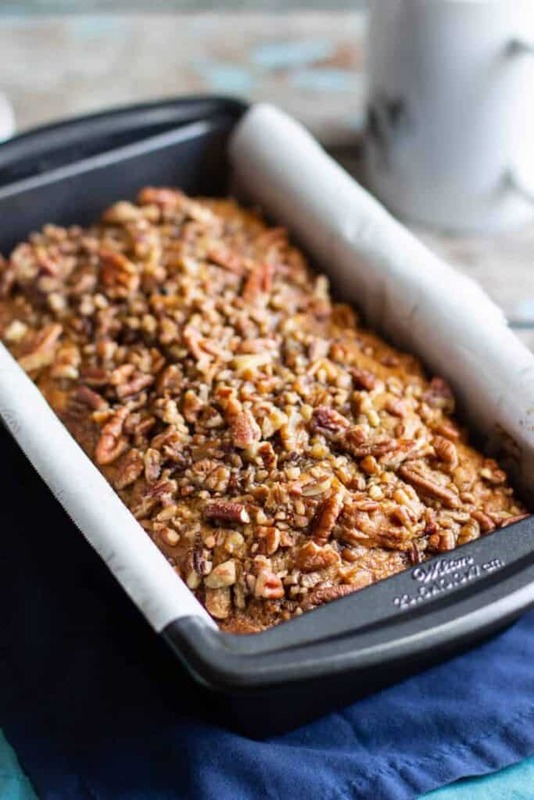 I subbed real maple syrup for brown sugar to make this banana bread refined sugar-free, too! 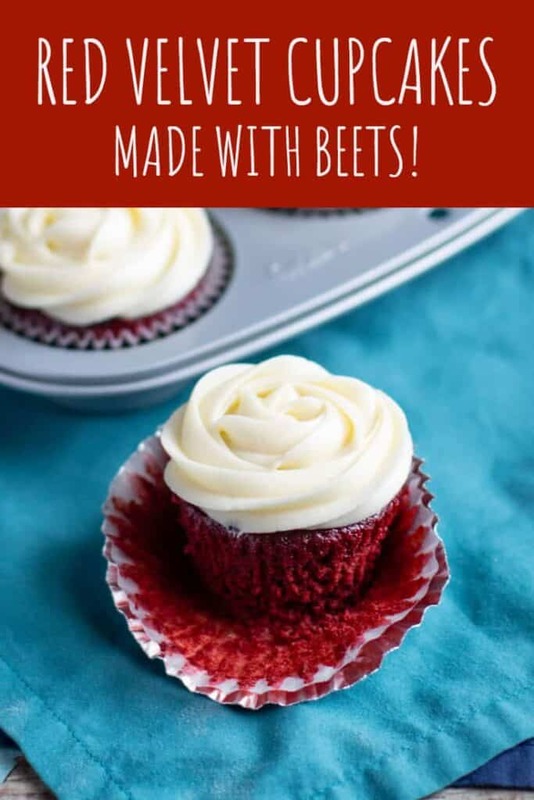 Part of me likes the idea of baking with less refined sugar. I’m thinking about giving dates a try as a sweetener. For, you know, nutritional reasons and whatnot. Then again, part of me just really likes maple syrup. The real stuff. No Mrs. Butterworth’s here. I used this bourbon barrel aged variety (found at Costco), but use whatever kind that you like! 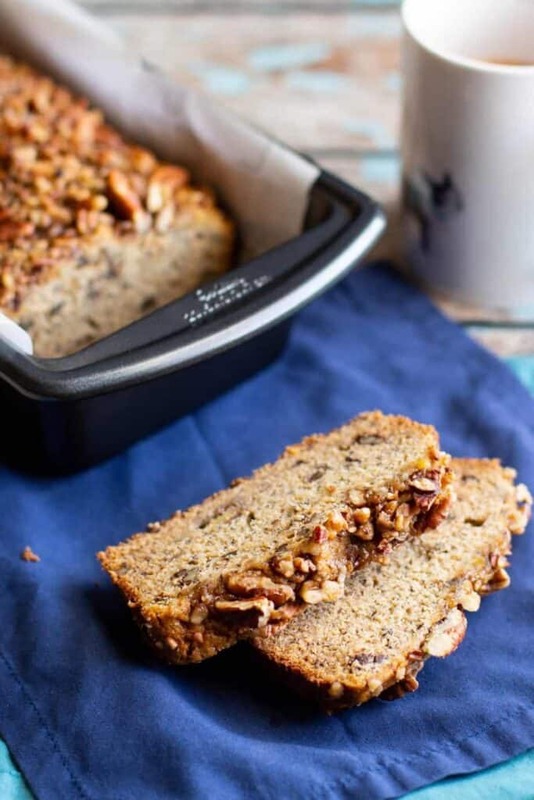 I’d be remiss if I didn’t also mention that this banana bread is made with brown butter. 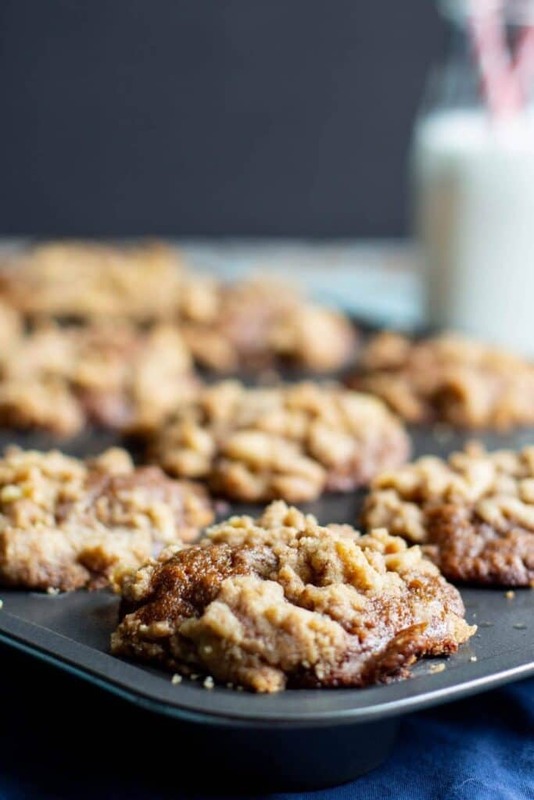 Who doesn’t like brown butter? It is 10/10. I’ve been slowly tiptoeing into the gluten free baking world, and definitely want to increase my GF repertoire. So far I’ve shown you Gluten Free Muesli Muffins and Coconut Macaroons. 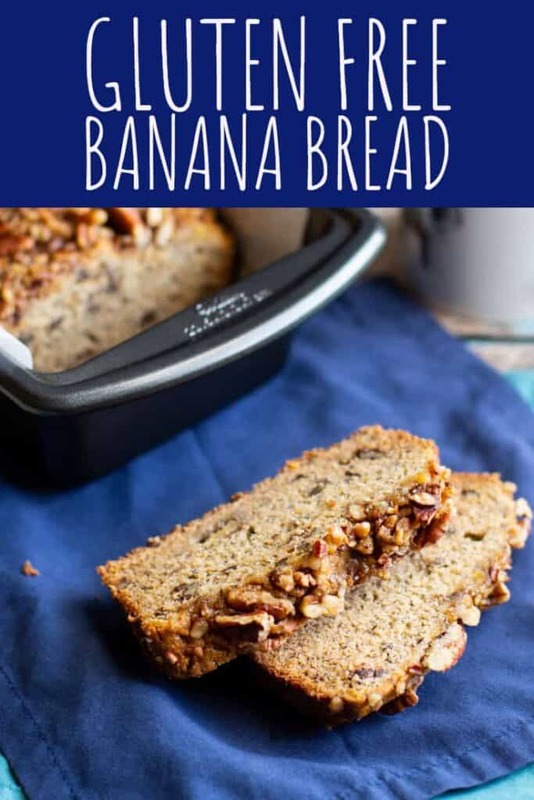 And now this gluten free banana bread! Line a 9x5-inch loaf pan with a strip of parchment paper sling. Allowing an inch or so of parchment paper to hang over the long edges. Spray the pan and parchment paper with cooking spray and set aside. Pour the brown butter into a bowl. Make sure to scrape all of the toasty, brown bits into the bowl as well. Let the brown butter cool slightly for 10-15 minutes. 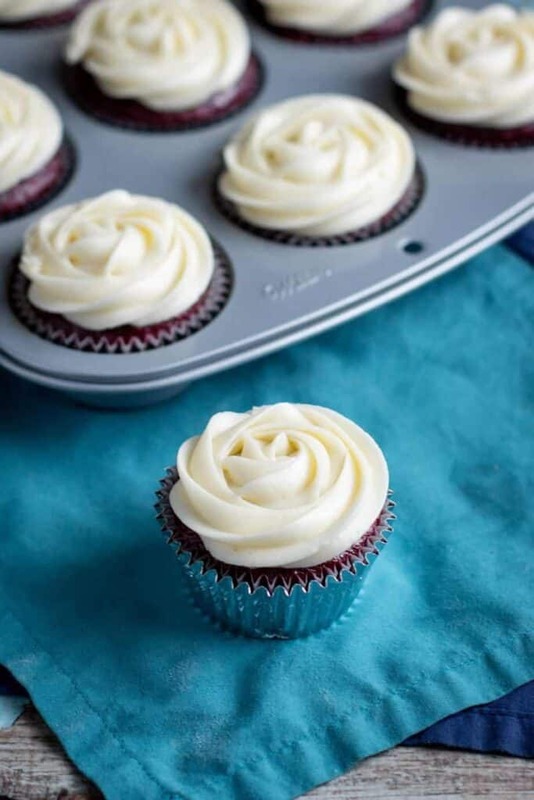 In a large bowl, whisk the flour, baking soda, baking powder, salt, cinnamon, and nutmeg together. Set aside. In a medium-sized bowl, whisk the maple syrup, eggs, mashed bananas, and vanilla extract. Once the brown butter has cooled slightly, whisk that into the wet ingredients, too. Add the wet ingredients to the dry. Fold the wet and the dry ingredients together, but don't over mix. Add the chopped pecans and stir until distributed throughout the batter. Pour the batter into the prepared pan, smoothing the top with a spatula. Sprinkle the remaining chopped pecans evenly over the top of the batter. Pour 2 tbs over the pecans. 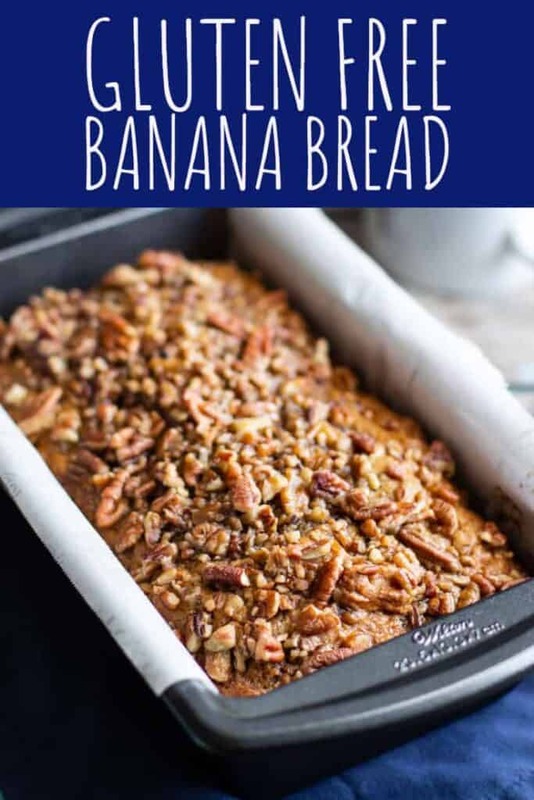 Bake the banana bread for 50-55 minutes, or until a toothpick, when inserted into the center, comes out clean. 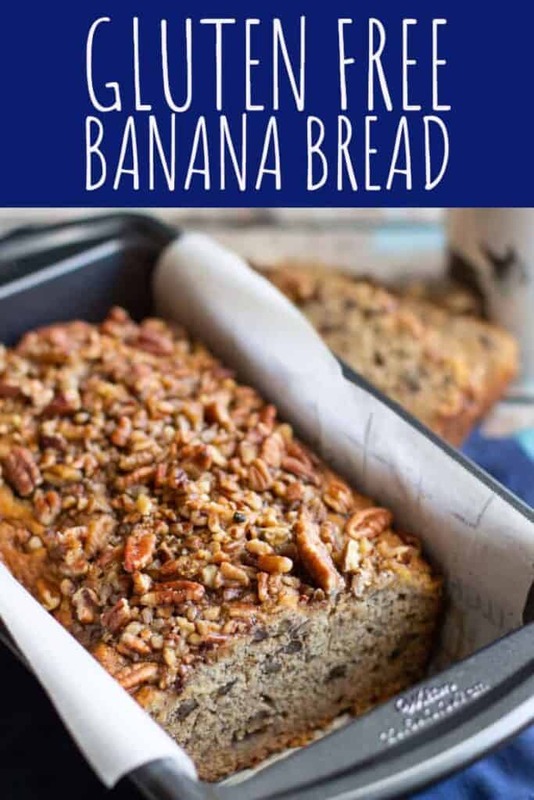 Looking for more banana bread recipes? 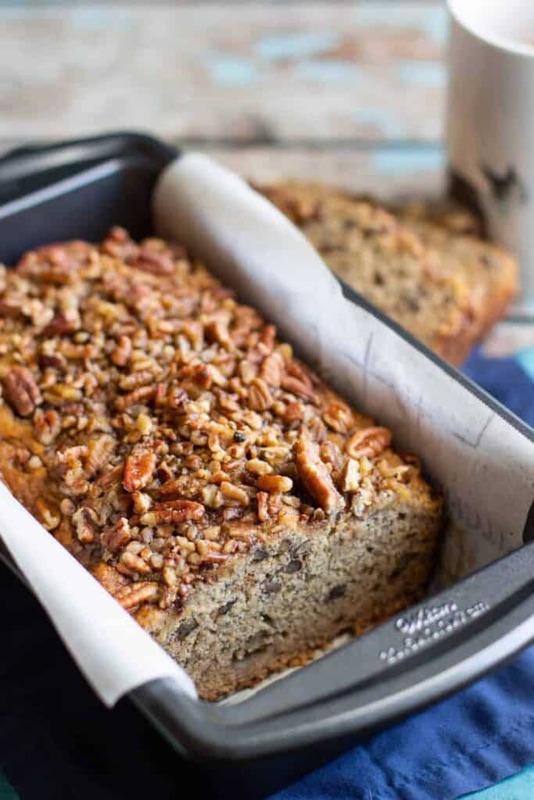 (Of course you are) How about Hummingbird Banana Bread or Healthy Chocolate Banana Bread? How about some banana bread with chocolate chips and oatmeal? AND. 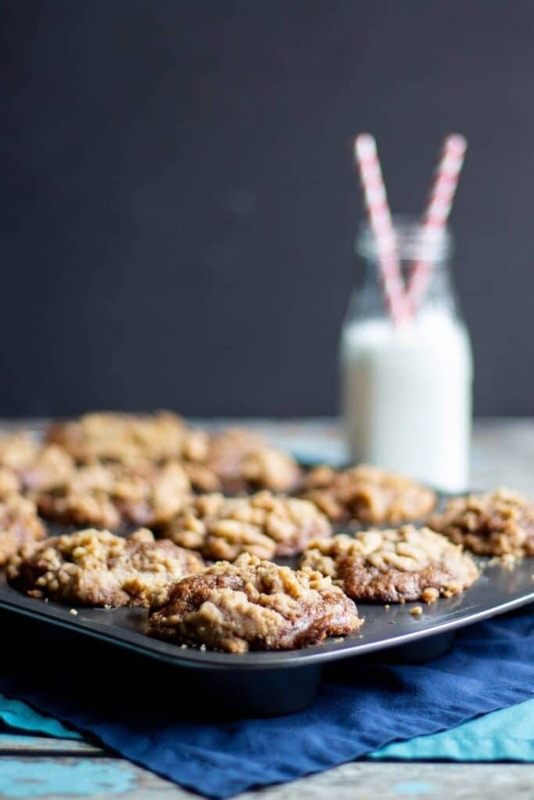 Let’s not forget Chocolate Chip Banana Bread Cookies! 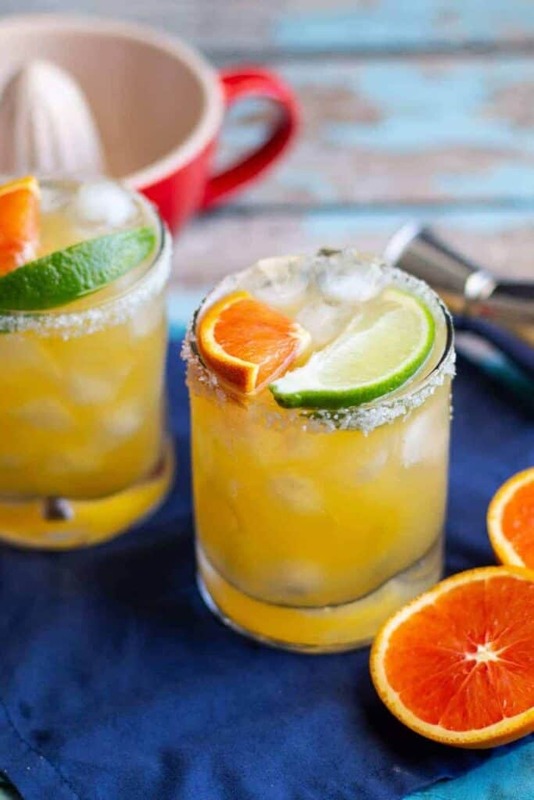 These Cara Cara Orange Margaritas are sweet, just a little tart, and pleasantly boozy. You will not regret shaking up one (or two!) of these drinks. I am obsessed with Cara Cara oranges. There, I said it. It’s always really exciting when they start showing up in grocery stores. Fortunately, Costco often carries them during the Winter months. I picked up a big bag during our last shopping trip. Cara Caras are sweet, not very tart, and have really pretty pink-orange flesh. I like to peel and slice them up to have for breakfast with some avocado and a little kosher salt. 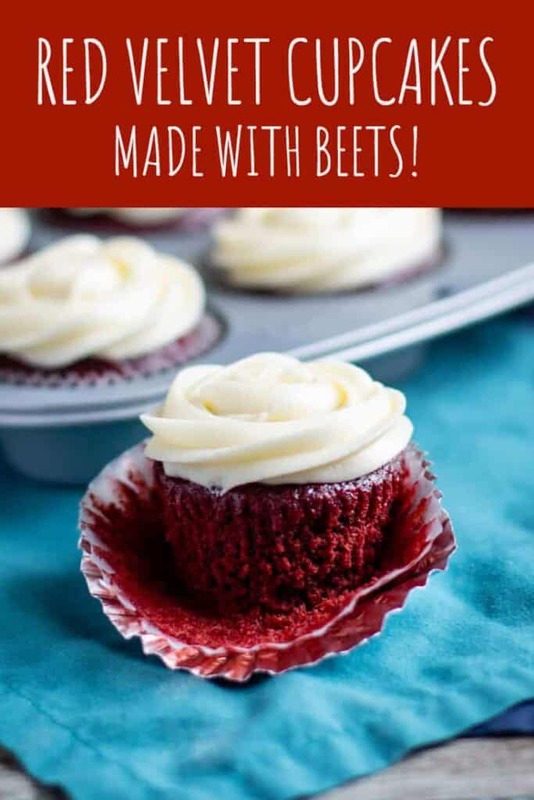 They’re also good in a salad. And now, I know that they’re great in a cocktail. If you can’t get your hands on Cara Cara oranges, you can sub navel or even blood oranges. But please use freshly juiced fruit. It makes all the difference. It can be as simple as cutting an orange in half and squeezing it over a strainer. 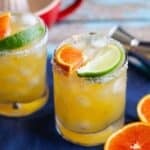 I put my Le Creuset citrus juicer to work when making these drinks (not sponsored–boy do I wish–I just really like it). Rim a rocks or margarita glass with lime juice and kosher salt. 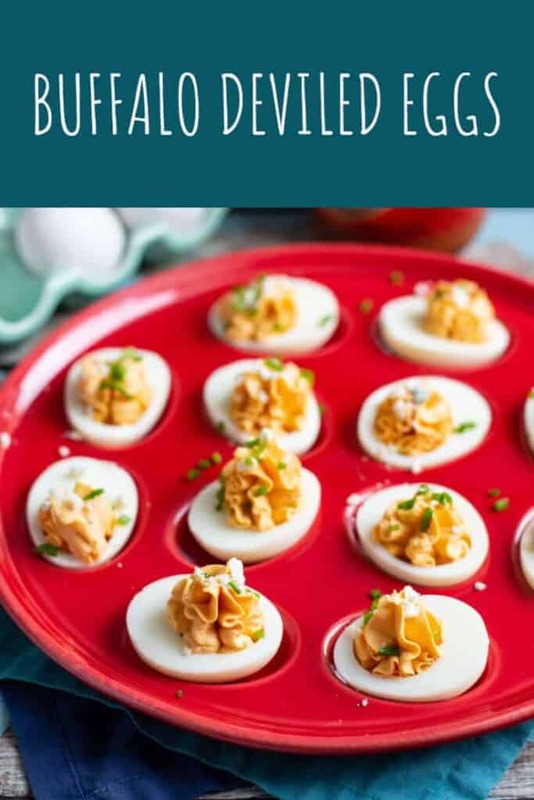 See the notes for detailed instructions on how to do this. Add ice to the glass and set aside. 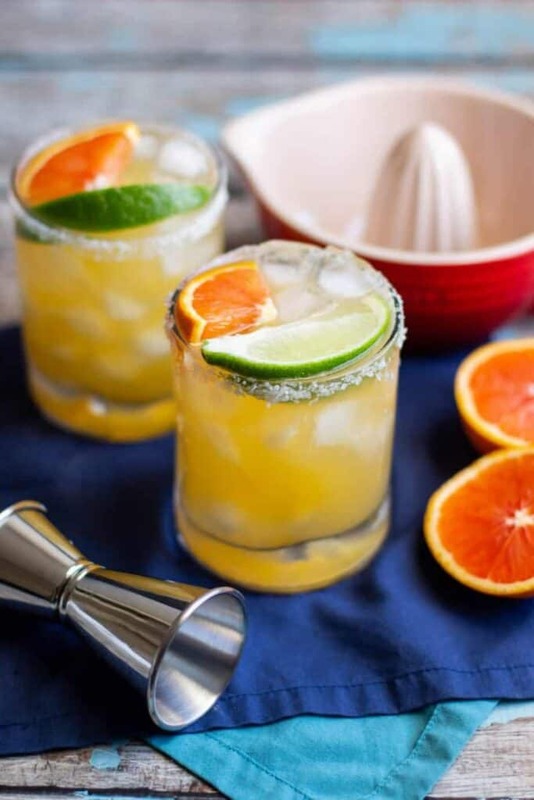 Over ice, add the orange juice, tequila, triple sec, and lime juice to a cocktail shaker. Shake until very cold. Strain the drink into the prepared glass. 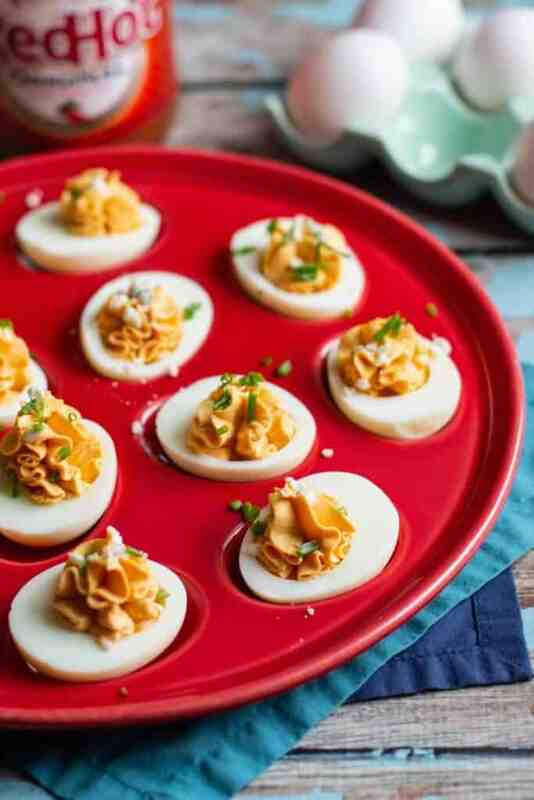 Garnish with lime and Cara Cara orange wedges. 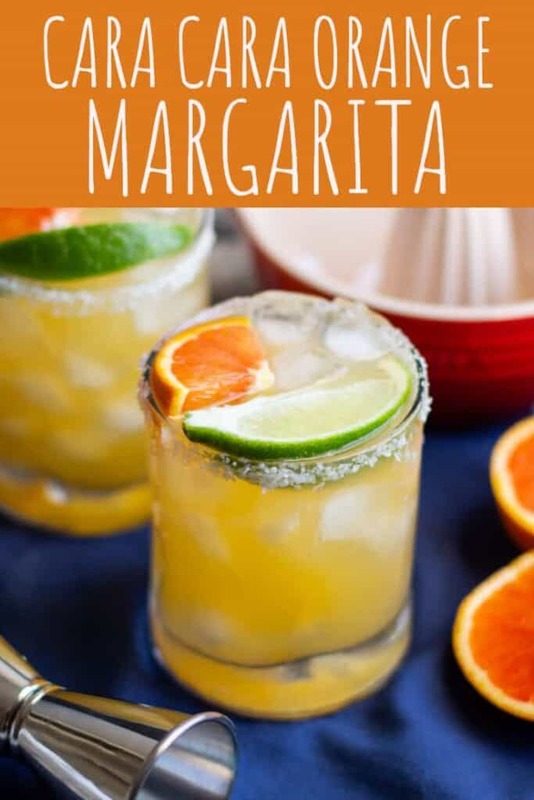 If you want to check out a couple other delicious margarita recipes, look no further than myPomegranate Margaritas and Apple Cider Margaritas. 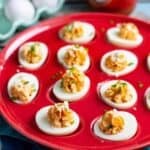 Or if you want other cocktails that use orange juice, take a look at my Orange Creamsicle Crush recipe or these Blood Orange Bourbon Sours. 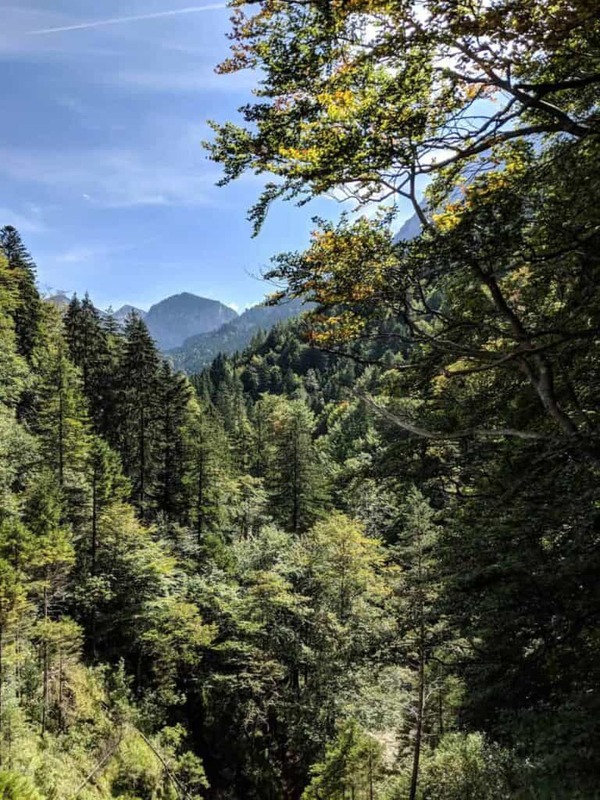 In September of 2018, I was fortunate enough to attend a conference in Munich, Germany. I brought my mom with me, and we made a vacation out of it. 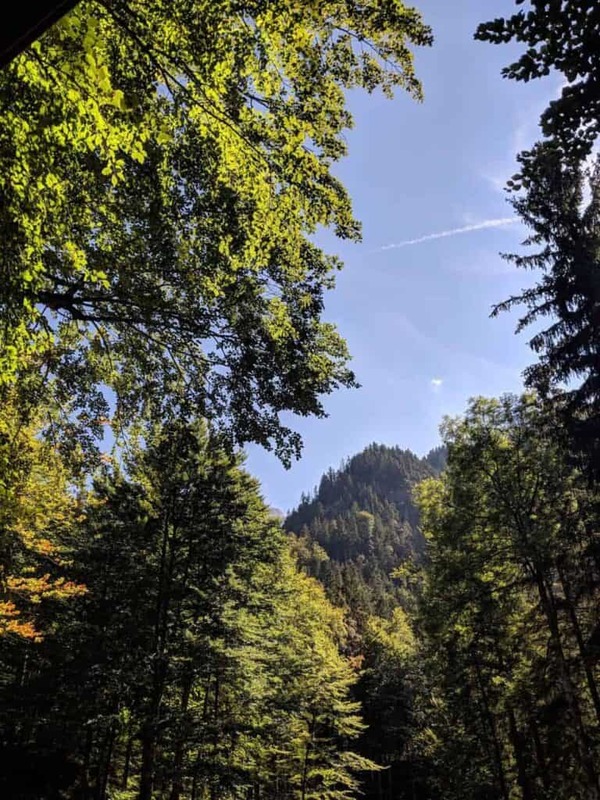 Though this wasn’t my first trip to Germany (I spent a few days in Berlin in May of 2018 for work), this was the longest stretch of time that I spent in the country. 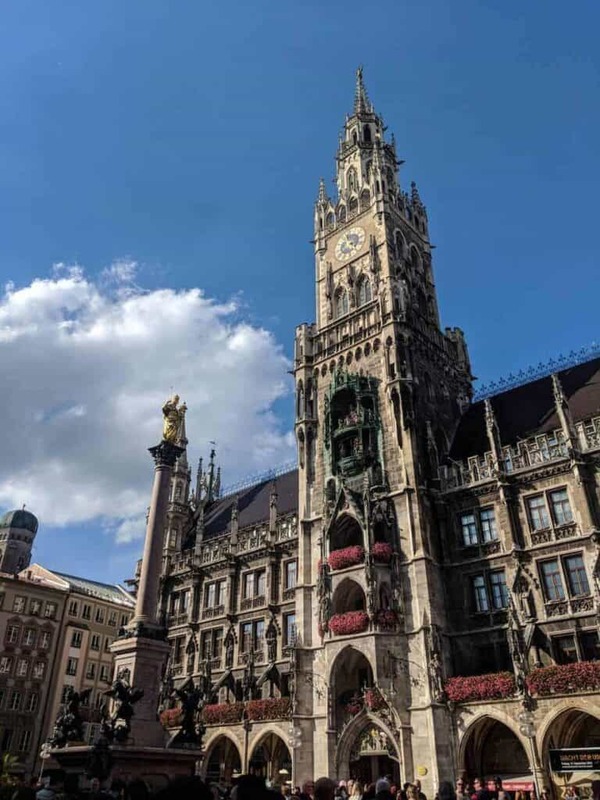 We got to explore Munich proper, as well as take some trips out fo the city. We spent a lot of time in the city itself. 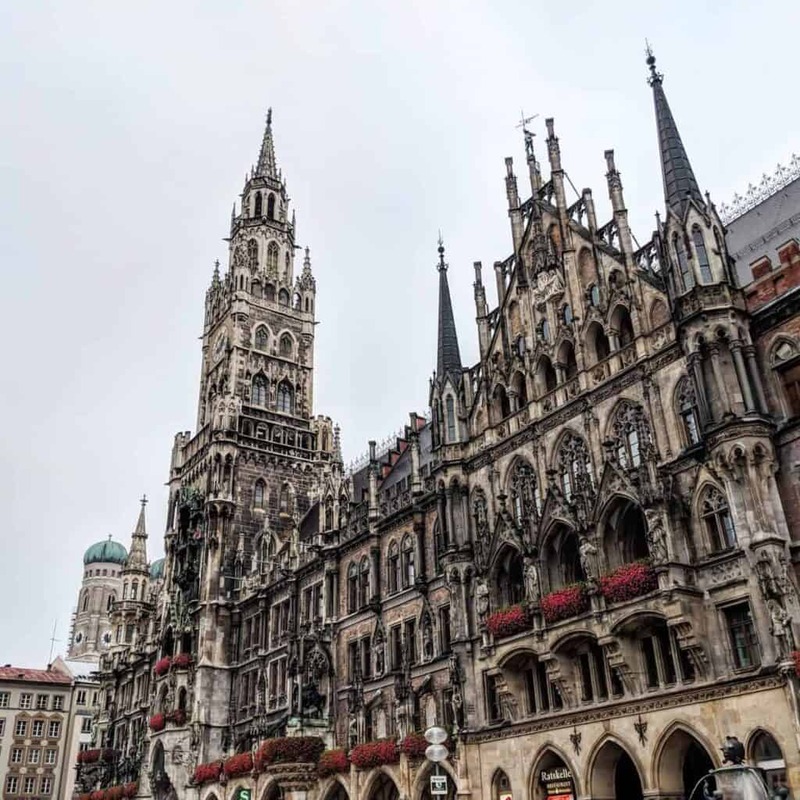 We spent time in the city’s main square, Marienplatz. 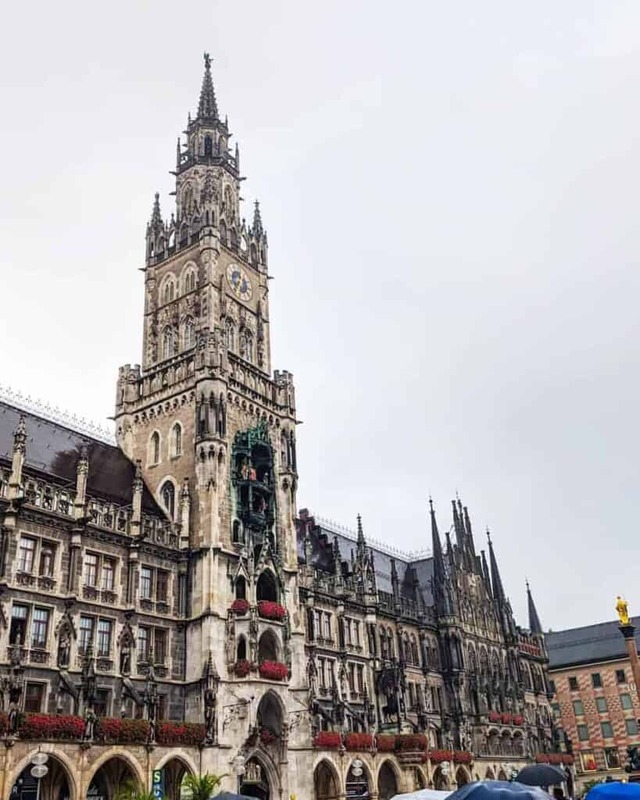 I probably took more photos of this building (Neues Rathaus = New City Hall) than anything else during the entire trip. It goes without saying, but the architecture is just beautiful. It was pretty rainy the day that we arrived in Munich, but the weather improved markedly later in the trip. We really leaned in to being tourists and took a bus tour. 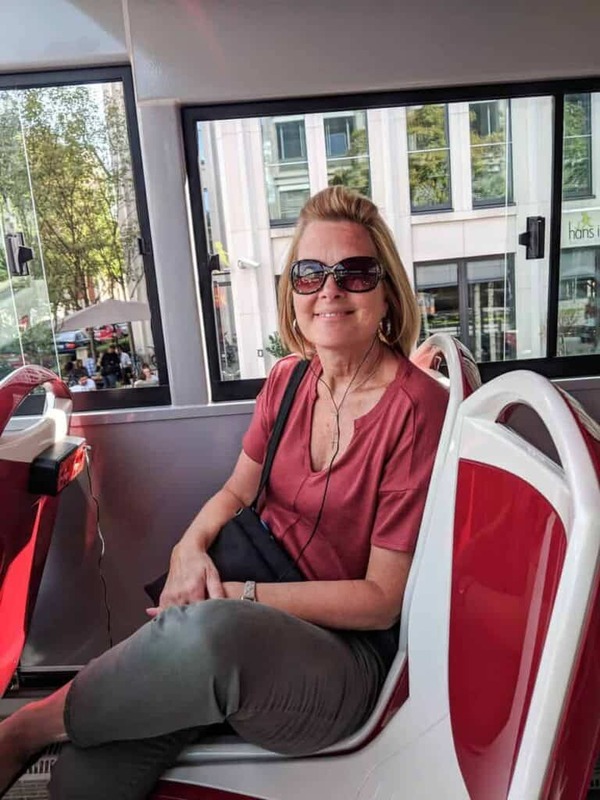 You’ll see my mom, below, living that bus tour life. You could hop on and off the bus at predetermined stops. One of those stops was Schloss Nymphenburg (or Nymphenburg Palace). 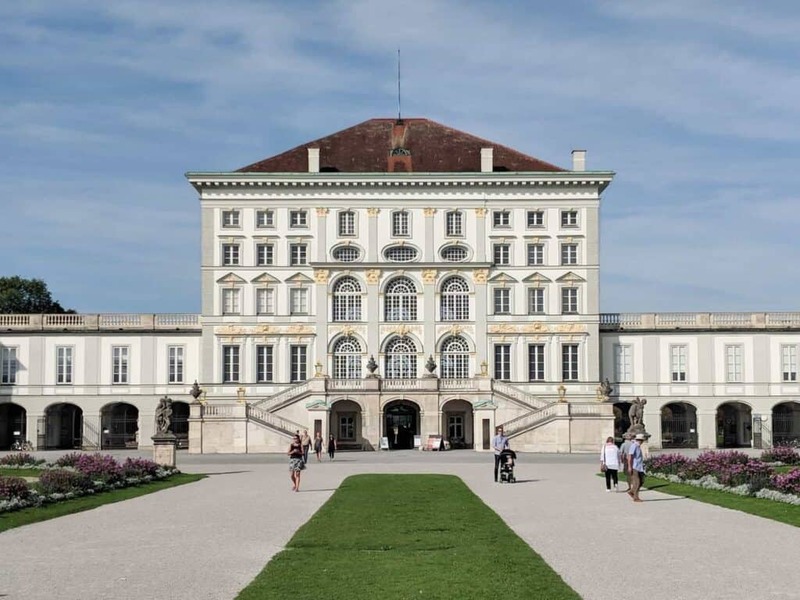 There were large, beautiful grounds surrounding the palace. 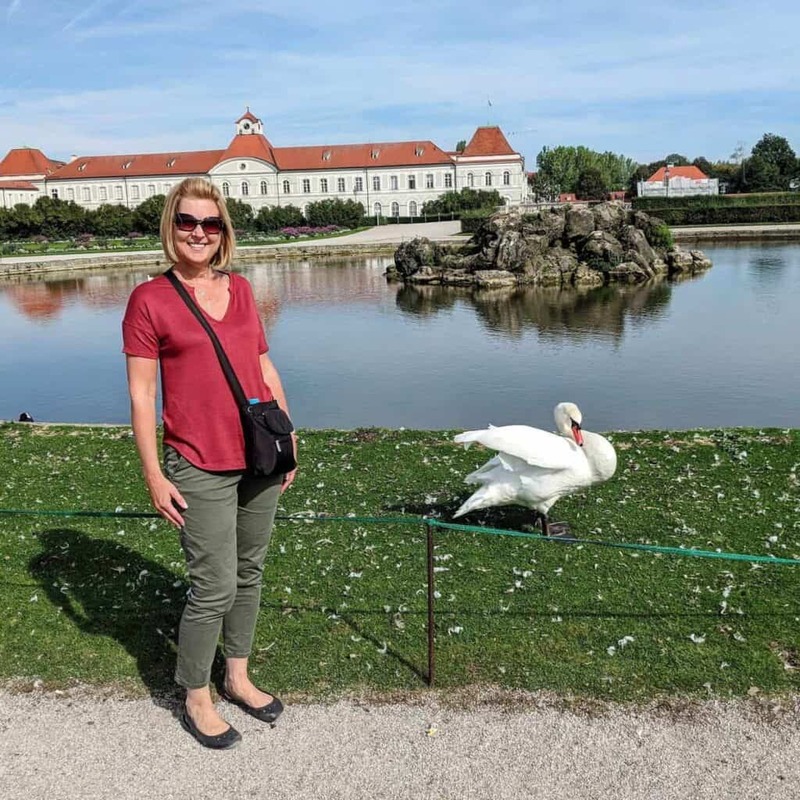 My mom also managed to not be attacked by a swan while at the palace. Swans are real jerks, amirite? 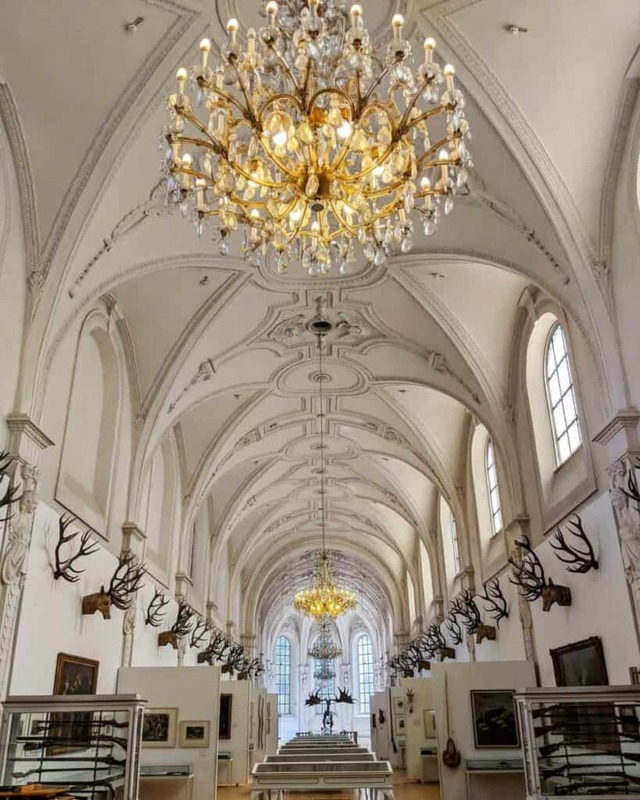 We also made a visit to the Deutsches Jagd und Fischereimuseum (Museum of Hunting and Fishing), which was very cool. As a hunter and fisherman myself, I really appreciated it. But I think that even non-sportsmen would appreciate it, too. It was very pretty and interesting. 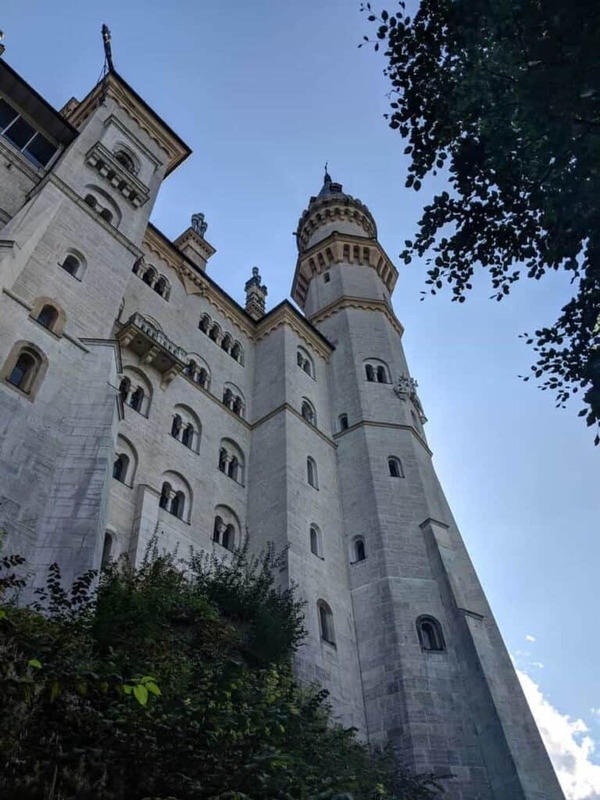 We also took a day trip to Neuschwanstein Castle in Schwangau, Germany. This is the castle that inspired Cinderella’s castle in Disney. 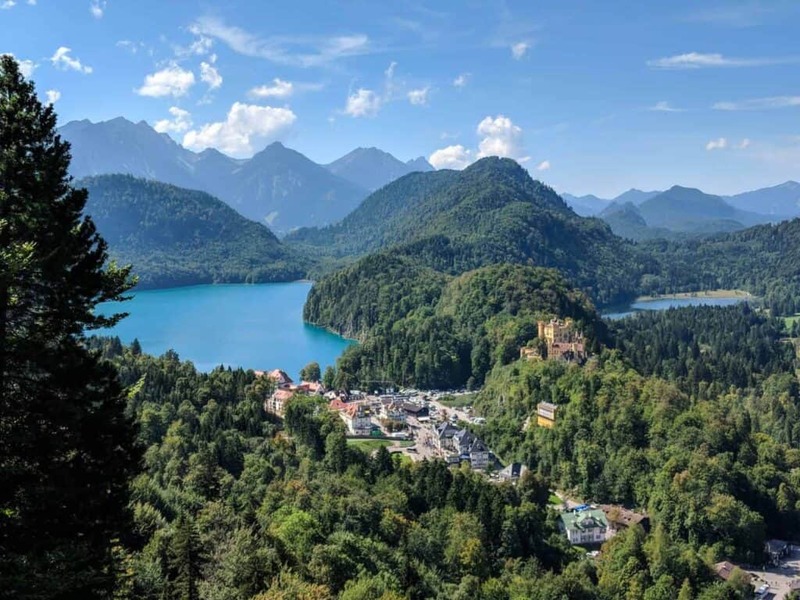 Schwangau is technically in the Bavarian Alps. Honestly, the scenery on the train ride alone made the trip worth it. Heart eyes emojis x10. 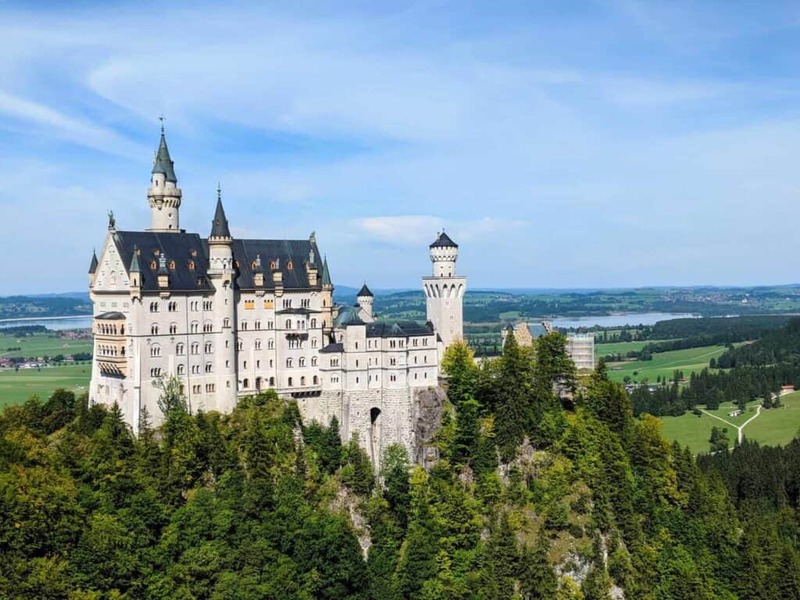 To get there, we had to take a train from Munich to Füssen, and then a bus from Füssen to Schwangau. 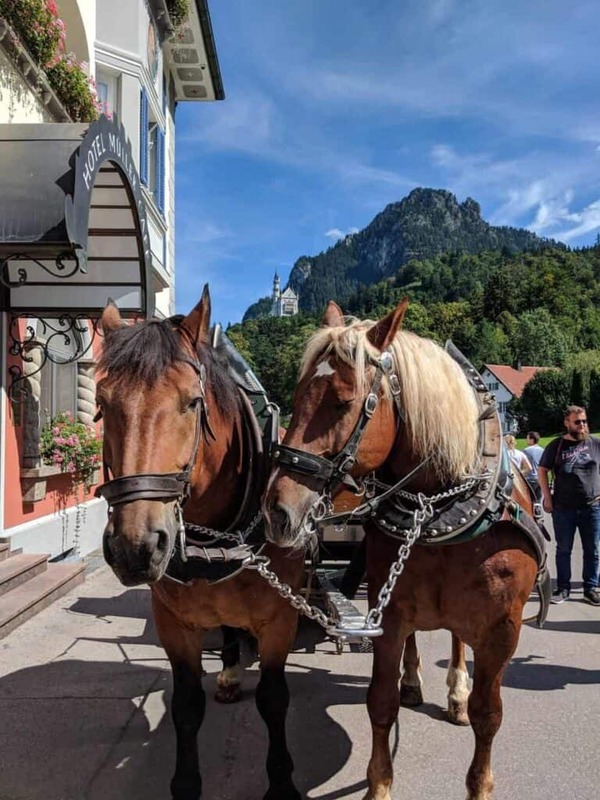 Once in Schwangau, you can either walk, take a bus (what we did), or a horse and carriage up to the castle (see below). The castle is in the background. Once further up the mountain, the views were so, so pretty. 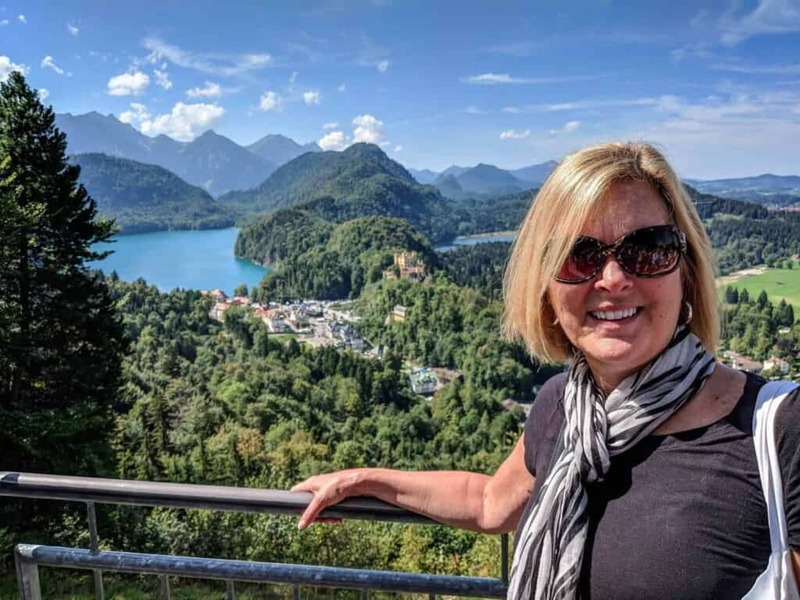 Behind my mom, and in the picture below it, you can see another castle (Hohenschwangau). You have to walk a bit further up the mountain to get to the castle. Unfortunately, they didn’t allow any photos inside. There’s also a bridge, called Marienbrücke (Queen Mary’s Bridge), that offers incredible views of the castle. It is very high up, and definitely made me a bit wobbly when walking out onto it. I took a few photos very quickly and then got off of the bridge. And I haven’t even talked about the food. So. Much. Pork. I’m not complaining, but dang. 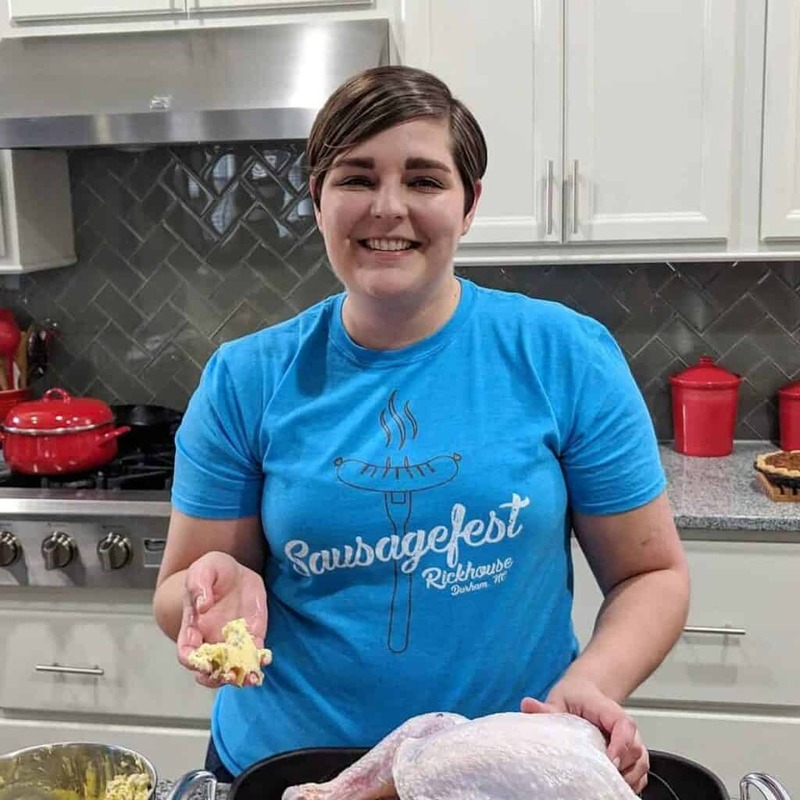 Pork, cabbage, and carbs were on the menu for nearly every meal. And the beer! So much good beer. I feel really fortunate that I got to go on this trip, and especially to have been able to go with my mom. Bavaria was incredible. 10/10 would visit again. 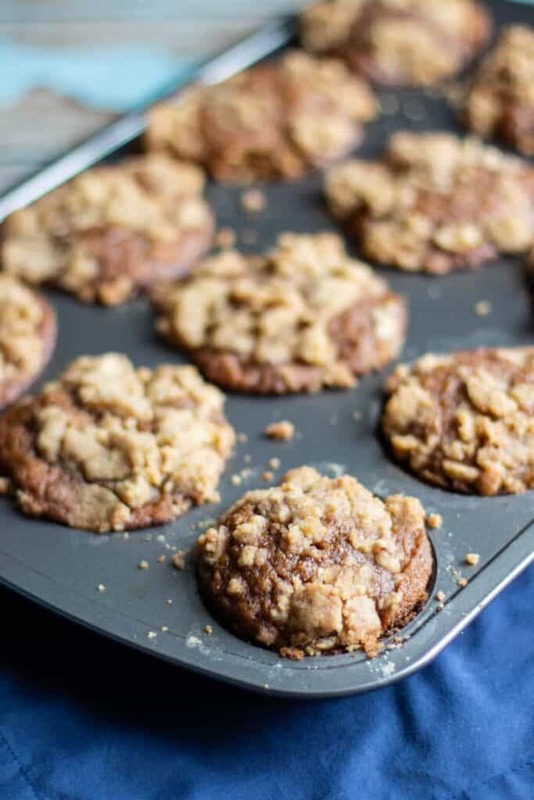 These Gingerbread Banana Muffins are spicy like gingerbread, but super moist thanks to the addition of bananas. 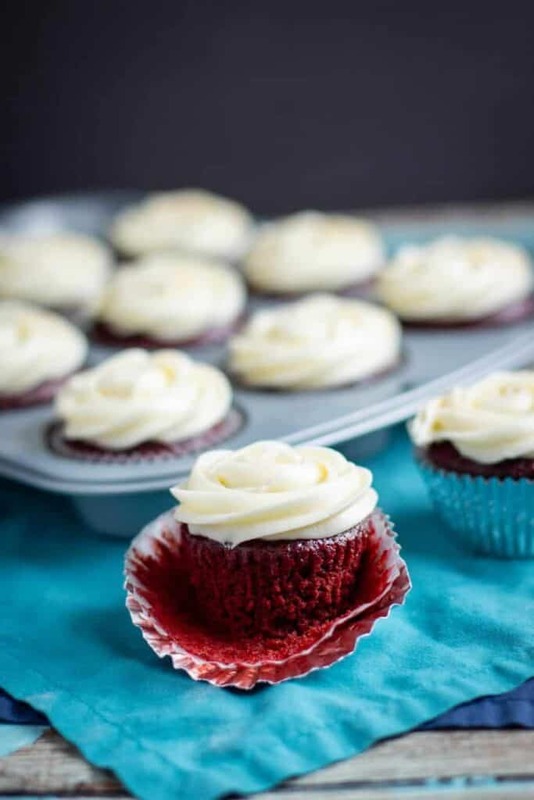 These delicious muffins will convince you to not limit your consumption of gingerbread goodies to Christmastime! Even though the Christmas season has come and gone, I don’t think that that’s any reason to not enjoy the warm spicy flavors of gingerbread. It’s still the middle of winter, after all. 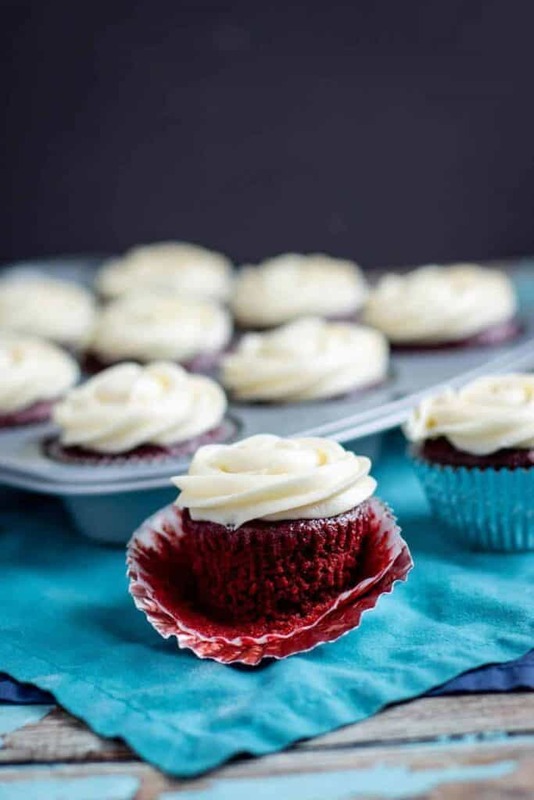 These muffins are moist (bananas), spicy like any good gingerbread should be, and have slightly sticky tops (thanks, molasses!). The crumb topping is sweet and keeps things interesting, texturally. 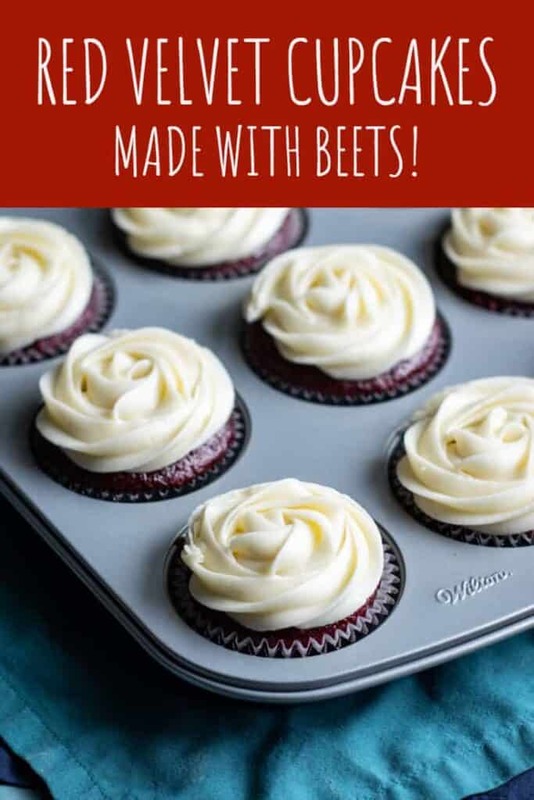 In creating the recipe for these muffins, I tinkered with the number of bananas, as well as various amounts of molasses and spices. I was looking for a muffin that had all of the moistness of a banana muffin without tasting too banana-y. If that makes sense. I also wanted the gingerbread flavor to be pretty prominent without being overbearing. After three tries, I think I’ve ended up with a winner of a recipe. I hope that you agree. 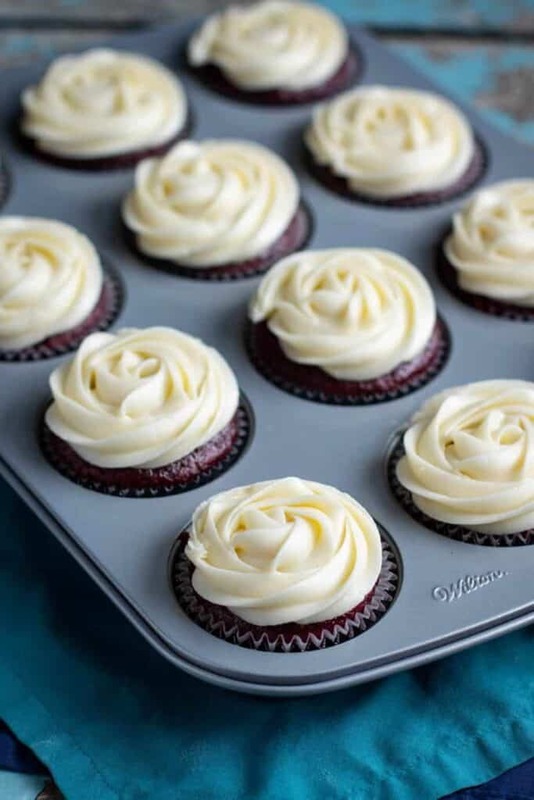 Preheat the oven to 350 degrees F. Spray two muffin tins with cooking spray; set aside. 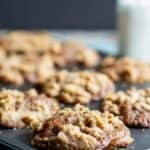 In a medium-sized bowl, whisk the flour, salt, ginger, cinnamon, cloves, allspice, nutmeg, baking powder, and baking soda together. Set aside. In another medium-sized bowl, combine the bananas, butter, eggs, vanilla extract, granulated sugar, brown sugar, and molasses. 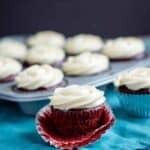 Scoop the batter into the prepared muffin tins, filling them approximately 3/4 of the way full. 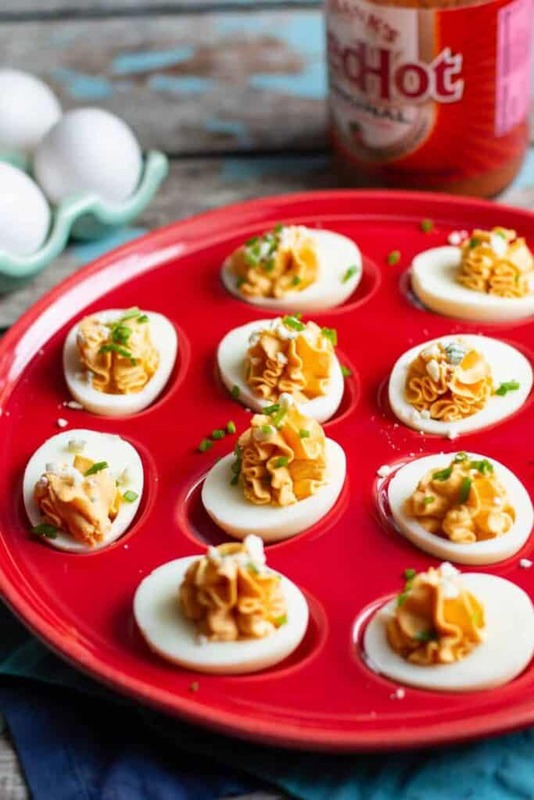 Toss all ingredients together with a fork until crumbly. 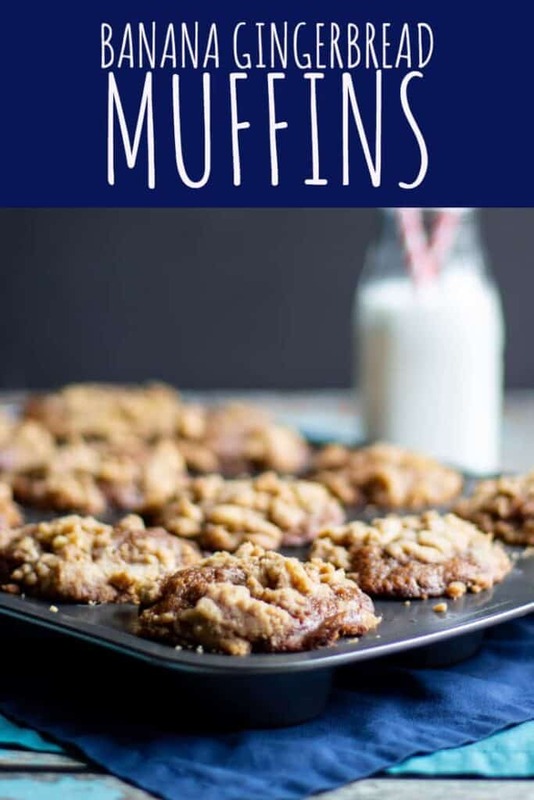 Top the muffin batter with the crumb topping, dividing it evenly between each of the muffins. 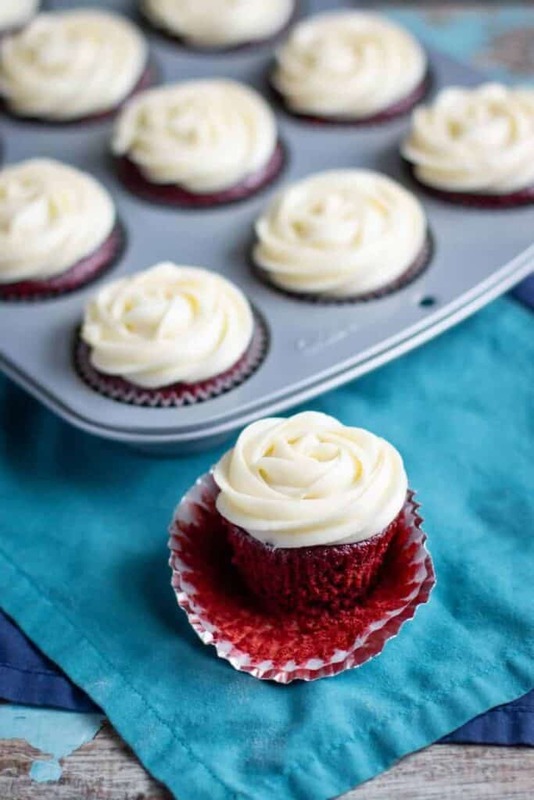 Bake the muffins for 20 minutes, or until a toothpick, when inserted into the center of a muffin, comes out clean. Need more gingerbread goodness in your life? Check out my Gingerbread Crinkle Cookies! 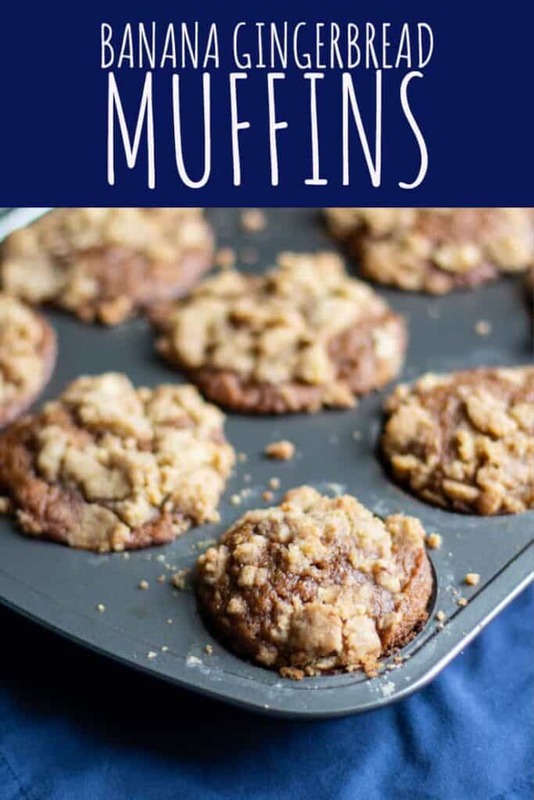 Or maybe you need more muffins? Of course you do. 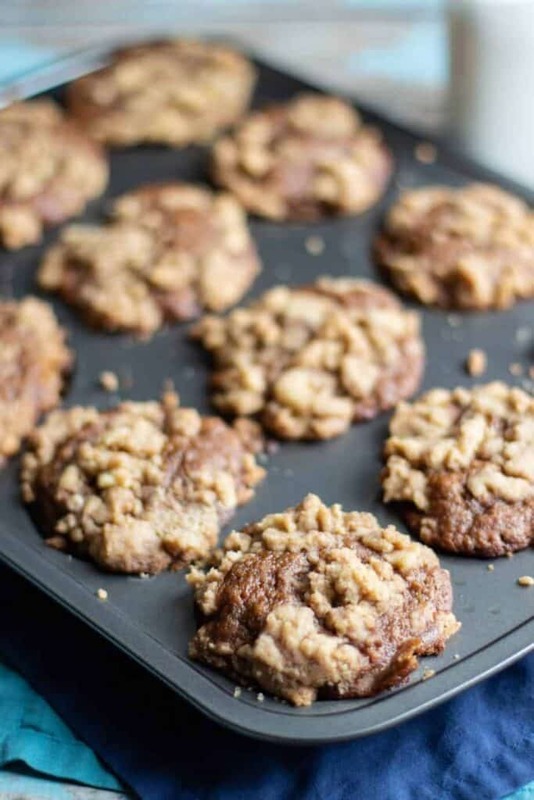 Try these Apple Oat Streusel Muffins and Gluten Free Muesli Muffins. You could also check out these Pumpkin Chocolate Chip Muffins and Double Chocolate Banana Walnut Muffins! 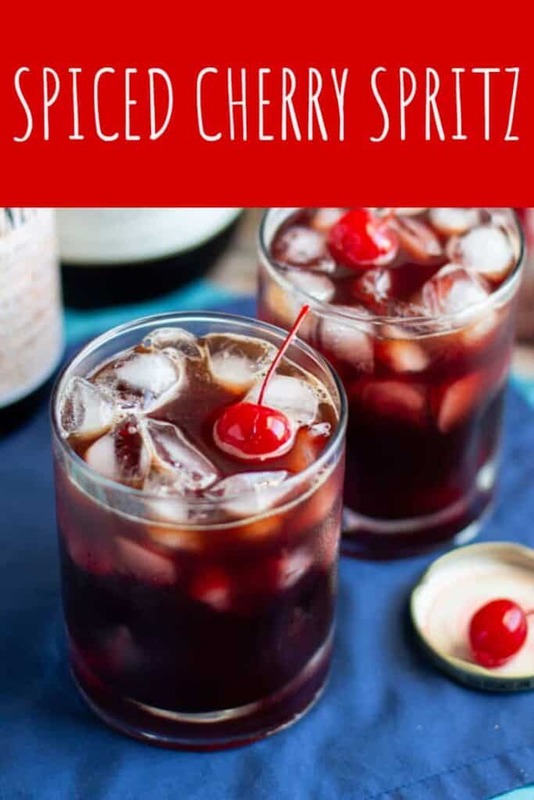 This Spiced Cherry Spritz is a surprisingly complex little cocktail given that it’s made with only 3 ingredients. 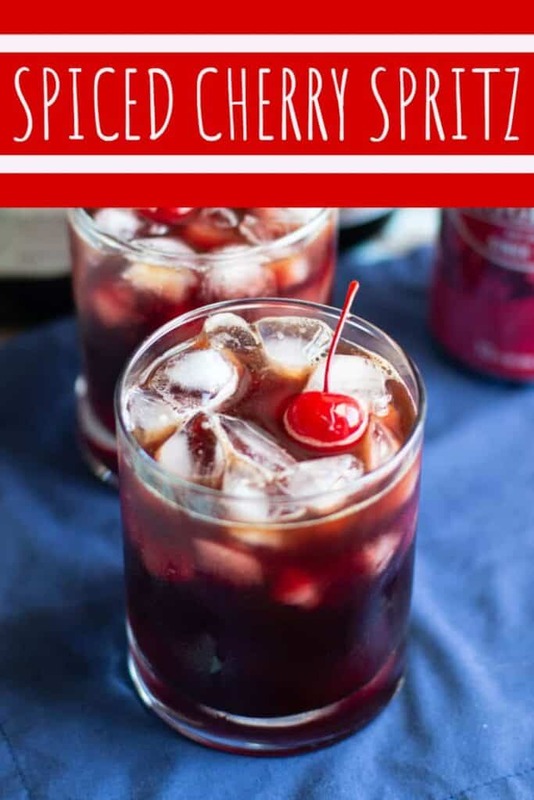 Okay, four, if you include the maraschino cherry. 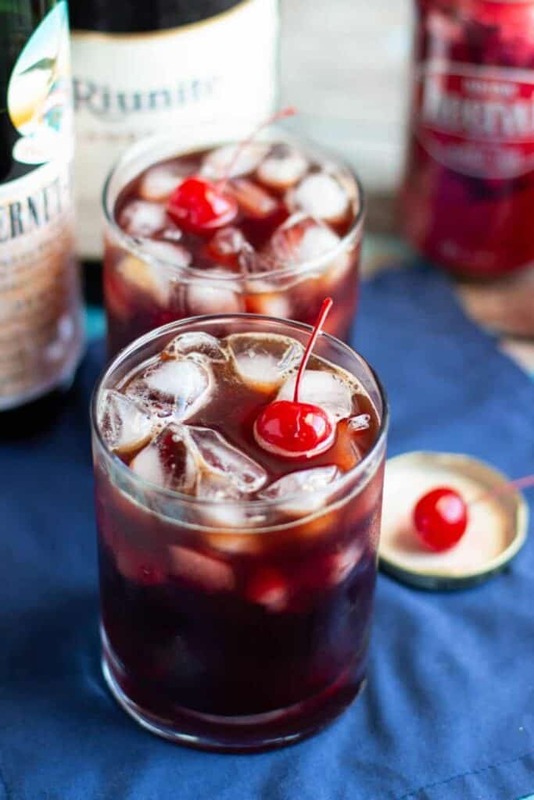 The Cheerwine and Lambrusco make it a little sweet, while the Fernet Branca lends some bitterness and keeps it interesting. You’ve probably noticed that I’ve been sharing a lot of cocktails lately. I’m not sorry about it. It’s just a pretty good indication of where my head (and heart) has been lately. Between the stress of the holidays and associated travel, a grant deadline, and other life stress, booze just seemed like the right choice. Fernet Branca is a variety of amaro (means “bitter” in Italian), which are Italian herbal liqueurs. 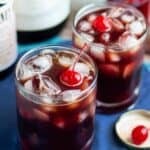 If you can’t get your hands on Fernet Branca, you can substitute a variety of other amari. Lambrusco is an Italian red wine. You may be familiar with the cheap, sweet, sorta fizzy Lambrusco. That is one option, but rest assured that there are plenty of other options, as well. As for the cherry soda, I went with Cheerwine. We’ve talked about Cheerwine before (check out these ice cream floats!). 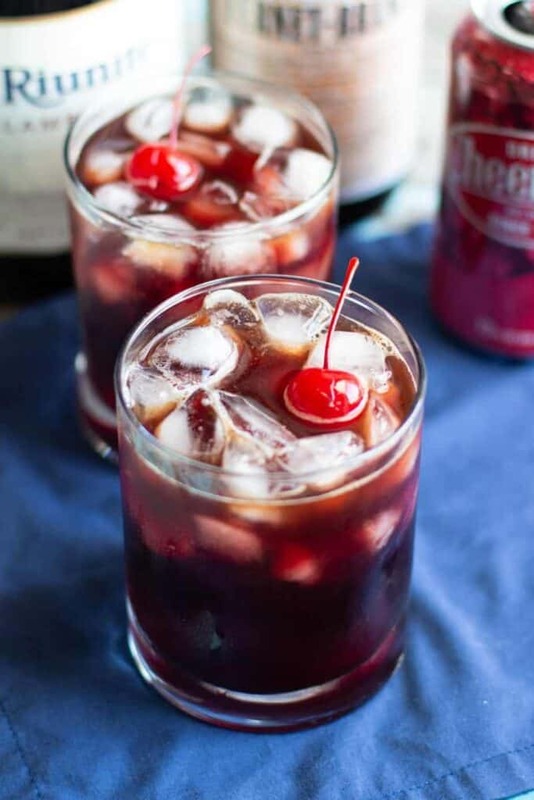 It’s a really sweet black cherry-flavored soda made by a company that’s headquartered in North Carolina. Now, onto the recipe: The recipe for this cocktail is modified slightly from Bon Appétit. 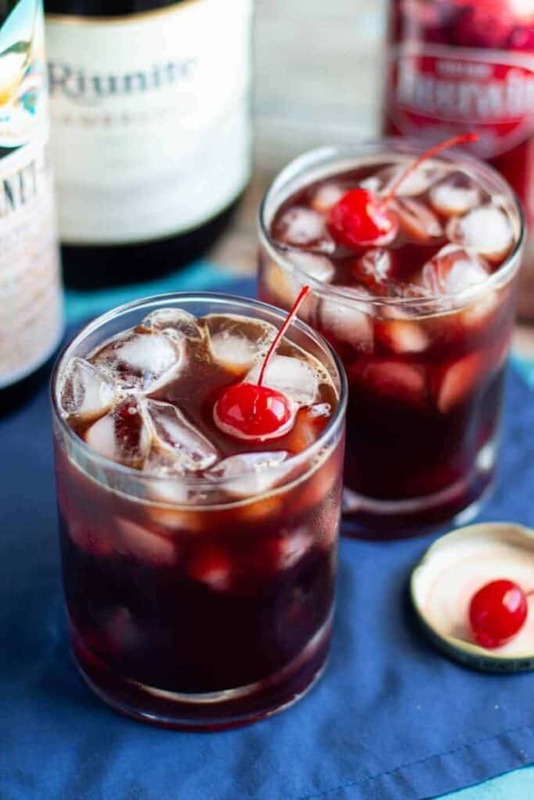 Pour Fernet Branca and Lambrusco into a rocks glass over ice. Top with Cheerwine. Stir to combine. 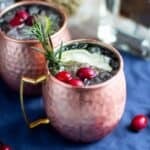 In case you’ve missed them, check out the cocktails I’ve shared recently:Cranberry Gin and Tonic, Cranberry Rosemary French 75, and Holiday Gin Moscow Mule. 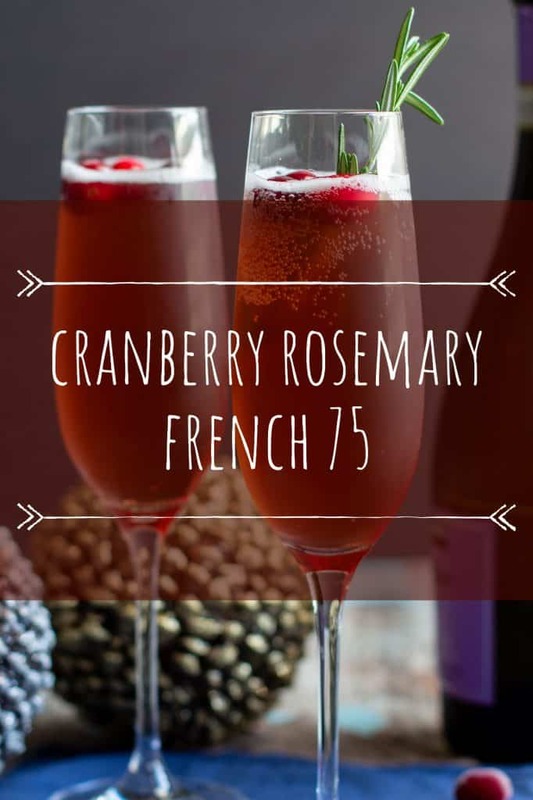 The Cranberry Rosemary French 75 is a riff on the classic French 75. Cranberry juice and rosemary infused vodka (plus fresh rosemary and cranberries for garnish!) make this drink especially festive. A classic French 75 is made with gin (though vodka can be used, too), lemon juice, simple syrup, and champagne. It’s a very pretty, classy looking cocktail. 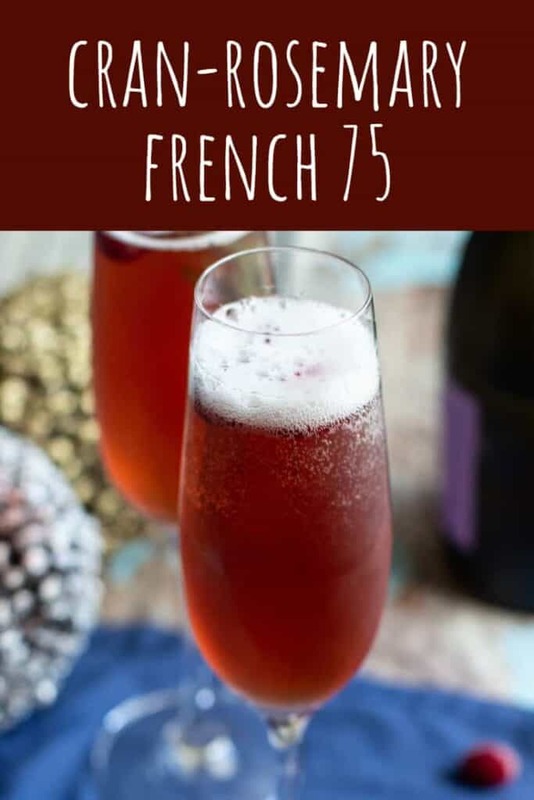 With New Year’s Eve being right around the corner, I thought that a variation on that classic drink would be really good. A while back, I made a batch of Rosemary Infused Vodka (mostly so that I could whip up the really delicious Palace Cafe Cocktail) and I’ve been looking to use it again ever since. 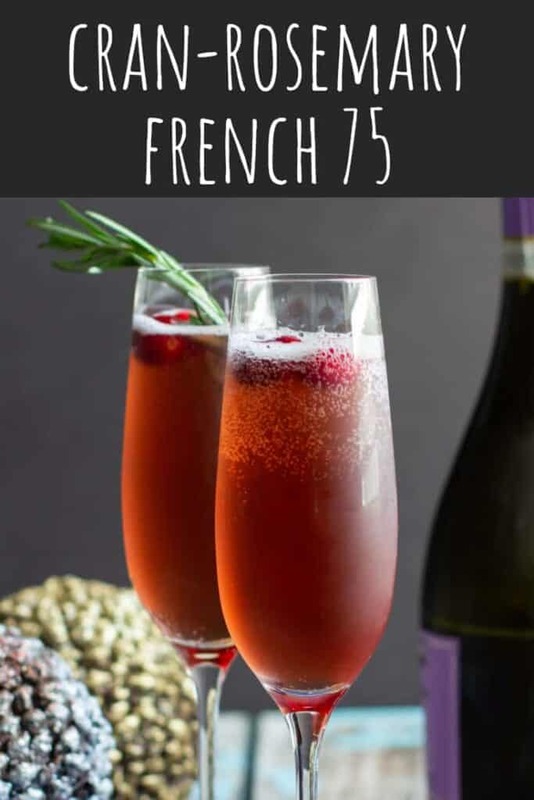 Since vodka is often used in a French 75, and rosemary and cranberry are great together, I decided to combine all of these flavors in one drink. 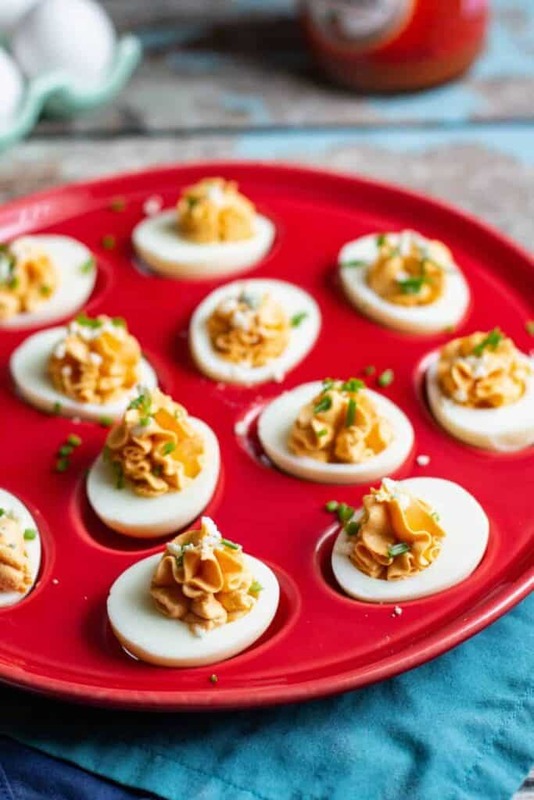 These cocktails look pretty impressive (and very festive). Only you have to know how easy it was to put them together. 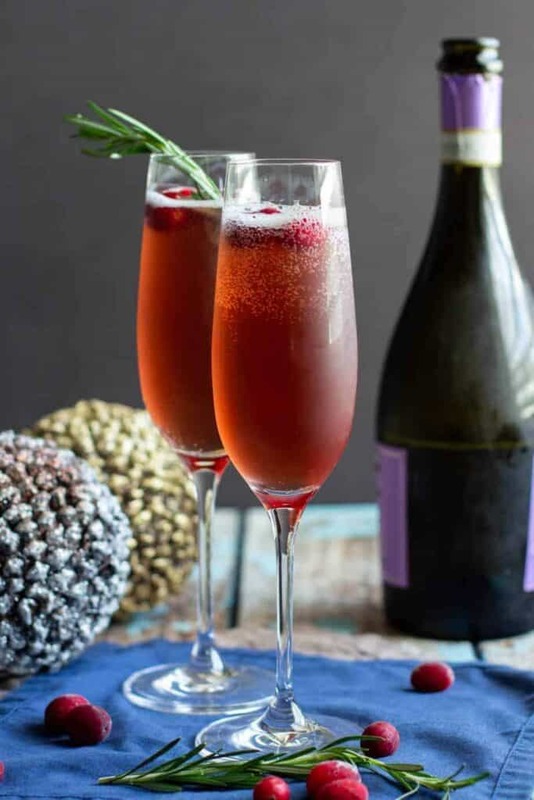 Add the rosemary infused vodka, cranberry juice, and lemon juice to a champagne flute. Top with champagne/prosecco/your bubbly of choice. Garnish with a sprig of fresh rosemary and a few fresh cranberries. 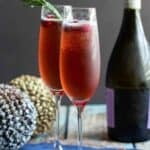 If you’re looking for more bubbly cocktails to help ring in the New Year, lemme make a few suggestions. Blackberry Champagne Floats couldn’t be easier (and you can use whatever flavor of sorbet you’d like). 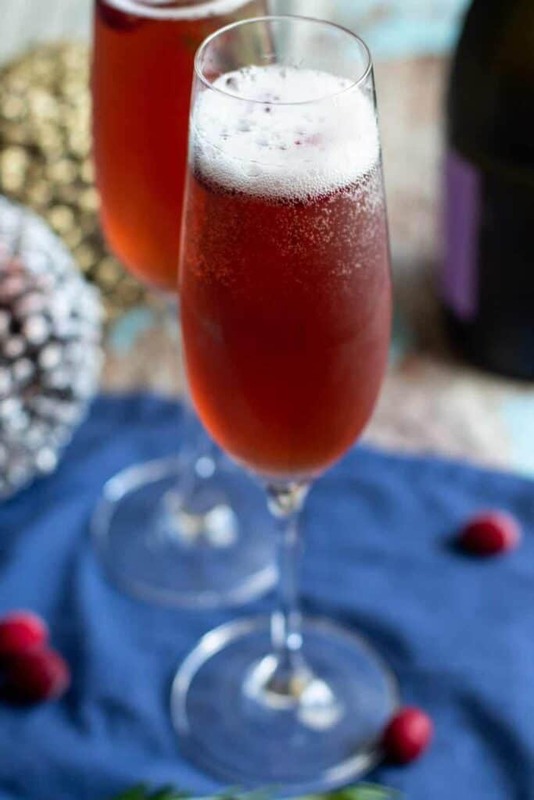 A Chambord Kir Royale looks and sounds very fancy, but is actually super easy to throw together. And let’s not forget about Pomegranate Champagne Moscow Mules, which are as pretty as they are tasty. 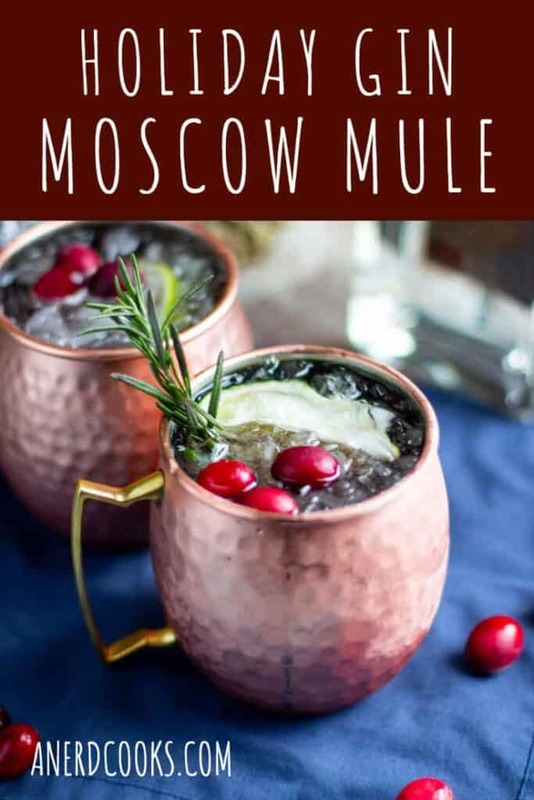 This Holiday Gin Moscow Mule is festive AF and is a really delicious variation on the Moscow Mule. While the flavors themselves are plenty festive enough, dressing this cocktail up with fresh rosemary and cranberries really takes it over the top! Speaking of which… The holiday season can be pretty stressful, amirite? 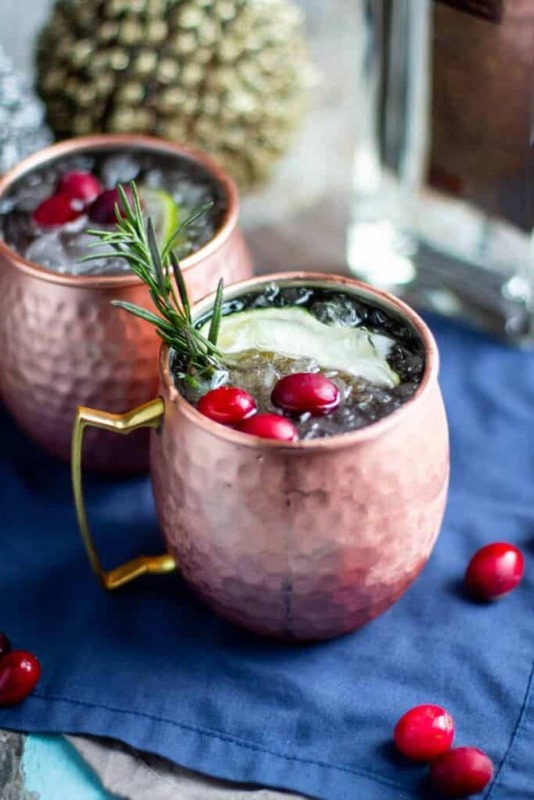 Mix up some Holiday Gin Moscow Mules, sit back, and relax. You deserve it. Might I suggest doing so in front of a roaring fire? That’s certainly my plan for this holiday season. Love gin and want more? Check out this equally festive Cranberry Gin and Tonic! In a copper mug over ice, combine the gin, cranberry juice, rosemary simple syrup, and lime juice. Garnish with fresh cranberries, a sprig of rosemary, and a lime wedge. I used Conniption American Dry Gin. To make the rosemary simple syrup, follow the steps for making regular simple syrup, but throw in 4-5 sprigs of fresh rosemary into the syrup once the sugar has dissolved. Let it steep until the simple syrup cools. Remove the rosemary and store in the fridge. 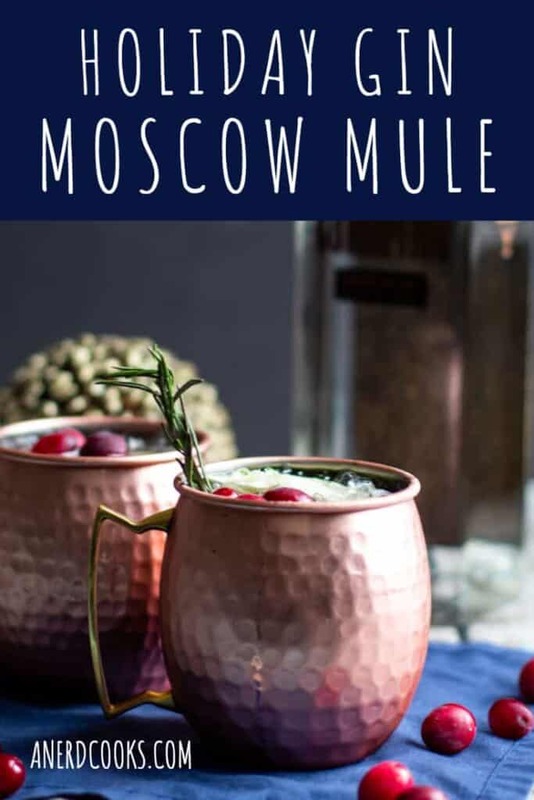 You all know I have a serious thing for Moscow Mules. Is my love for this cocktail over the top? Maybe. But if you’re looking for other Mules, I’ve got you covered. What kind of spirits do you fancy? Bourbon? There’s always the classic Bourbon Moscow Mule OR Maple Bourbon Moscow Mule. And let us not forget the Old Kentucky Mule. Is vodka more your thing? 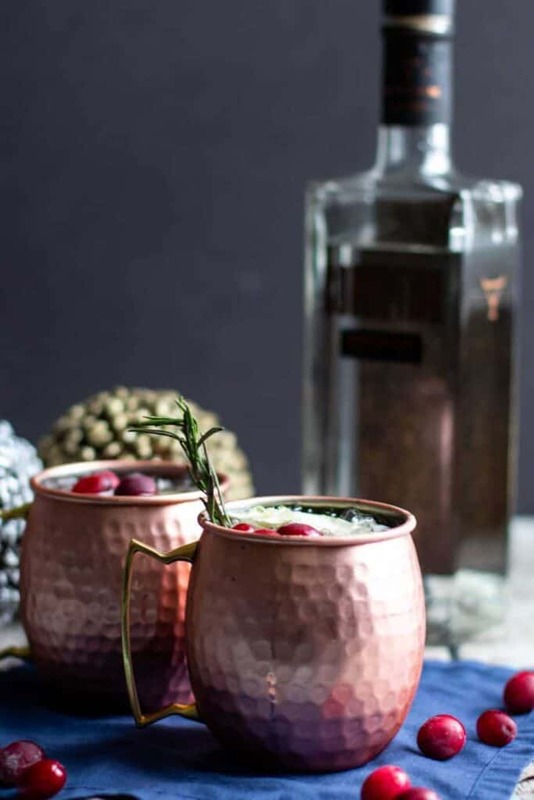 Take a gander at the Caramel Apple Moscow Mule or very festive Cranberry Vanilla Moscow Mule. 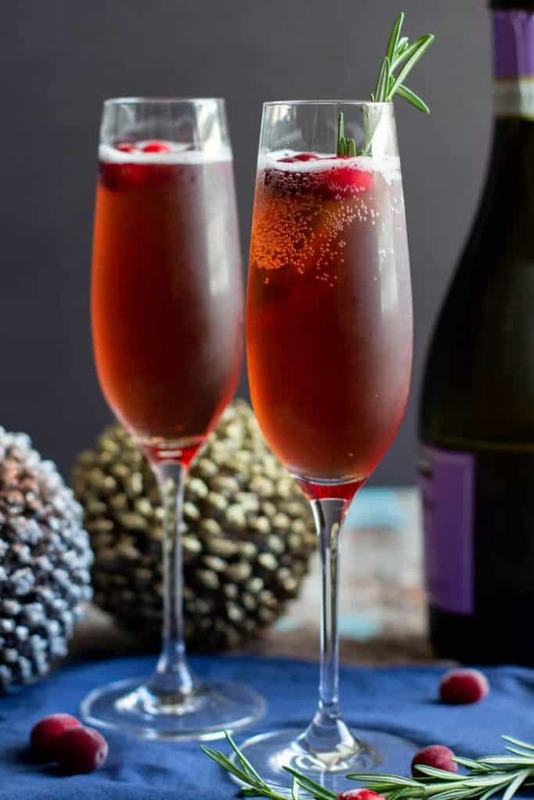 The Pomegranate Champagne Moscow Mule has vodka AND champagne! Last, but certainly not least, if you’re a fan of tequila, the Mexican Moscow Mule may be for you.